James Coleman, for me, was one of those scholars that I was surprised - and a little embarrassed - to have discovered so late. His oeuvre represents a significant contribution to general social theory, specifically sociological rational choice theory. Although opposed in some sense, or most senses, (seriously, it is refreshing to read a young James Coleman throw down with the phrase "Like many of [Parsons'] essays, it is difficult to read, and, like many, it does not have a coherent logical structure...") - it feels to me,Coleman's work is very much the progeny of Parsons' general theorizing. They both dealt with very similar problems (e.g. social order), and they both covered a wide range of socio-cultural territory with vast, sterilizing, leveling theoretical strokes (for better or worse). Skimming Foundations of Social Theory (1990), you can easily see that he employs several simple diagrams. The most infamous is referred to as "Coleman's Boat" pictured above from page 702 of Foundations. Namely, because the upside-down trapezoid looks like a boat - although some allude to its affinity to a bathtub. So, sometimes it is "Coleman's Bathtub." Its infamy is perhaps a result of its simplicity, and that it paints a picture of form of "methodological individualism" that also incorporates social structural or situational constraints. Coleman uses it to explain how micro-level action is linked to macro level structures (and vice versa). For a nice and short overview, see the short write-up by Yoshimichi Sato on the ISA's blog. Two authors (Mario Bunge and Gianluca Manzo) note the resemblances between Coleman and Boudon's model of macro-micro linkage and suggest that both sociologists should be the namesake of the boat. In Foundations, Coleman demonstrates the macro-micro-macro linkages with what he calls "frustration theories" of revolution. The social condition (macro) leads to frustrations among individuals (micro/attitude) which leads to aggression (micro/behavior), ultimately resulting in revolution (macro). He also employs the boat in his interpretation of Max Weber's thesis in The Protestant Ethic and the Spirit of Capitalism. Coleman argues that the weakest point in Weber's argument is the movement from micro to macro, the dotted line below. Number 3 or the move from individual rational actions into macro social phenomenon is, for Coleman, the most interesting part of the analysis. Although Coleman indicates a causal line from Macro-to-Macro, this is not an actual casual pathway: "the macro level is an abstraction, nevertheless an important one” (pg 12 of Foundations). If you notice Hedstroom and Ylikoski have a dotted-line leading from macro to macro. This is intentional, as they agree with Coleman (to an extent) and argue that "explanations that simply relate macro properties to each other (arrow 4) are unsatisfactory" (pg 59). Hartmut Esser also includes a dotted line between the macro levels of Coleman's Boat. Weber's macro link between macro level social fact and macro level social fact. Coleman diagrams the "methodological holism" implicit in Weber's thesis above and adds the "corrective," which shows the disaggregated, micro-level causal path of such an "abstracted" macro-macro link. In this 1986 article he does not even include a macro-to-macro line. See below. 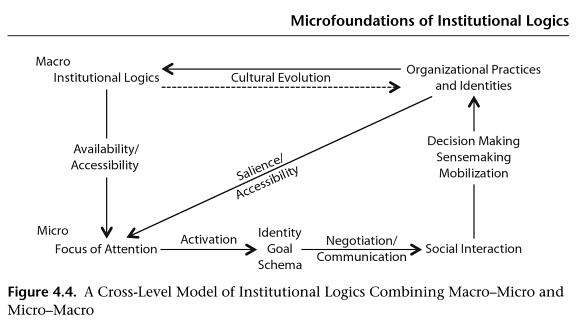 Another strand of theorization united under the banner of "institutional logics," emerging from organizational sociology, has recently invoked the boat in an attempt to explain the "microfoundations" of (presumable "macro") institutional logics. The authors then try to introduce dynamics, or a sense for how such institutional logics might change (similarly to attending to the role of "power," contemporary sociology generally demands that any theory include a built in account of how change might occur). In so doing, they elaborate probably the most complicated version of the Coleman Boat (see below). The fully elaborate Coleman Diagram with the strong committal arrow going from macro to macro.